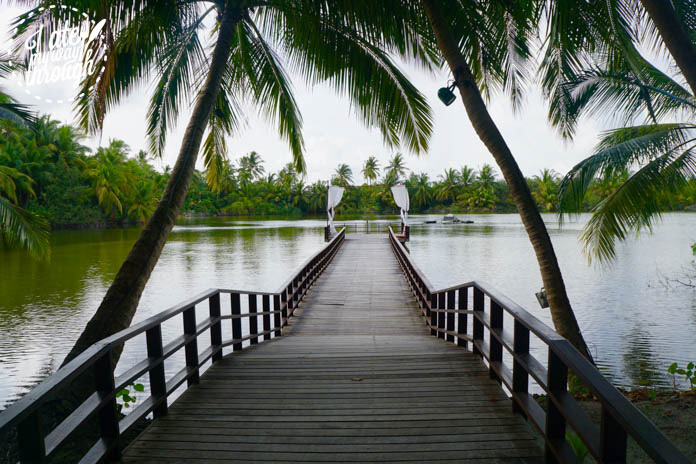 I have stayed at many Shangri-La Hotels now, ranging from the hotel’s signature Chinese properties in Shanghai at Pudong and Xi’An, to visiting their first European hotel in Britain, the Shangri-La at the Shard London, to the new Sri Lankan Shangri-La Hambantota property. Every single hotel boasts five-star service, a sleek conservative yet contemporary style and more often than not, incredible locations. 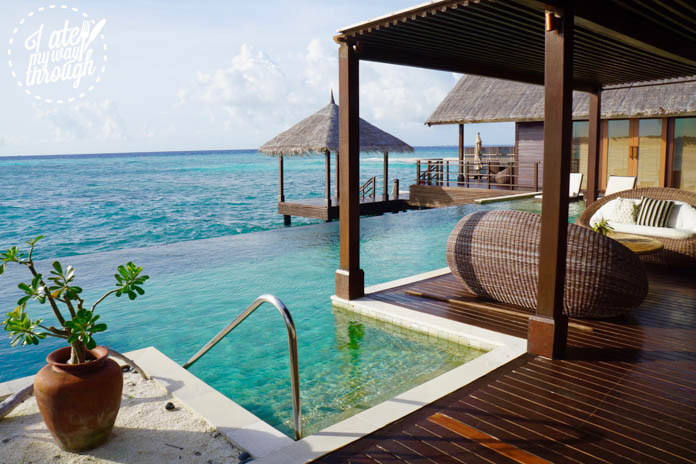 The Shangri-La Villingili Resort & Spa in the Maldives offers nothing less, and is probably my favourite Shangri-La hotel to date. This is a big call, but after my amazing experience I am certain that it would be hard to beat this. 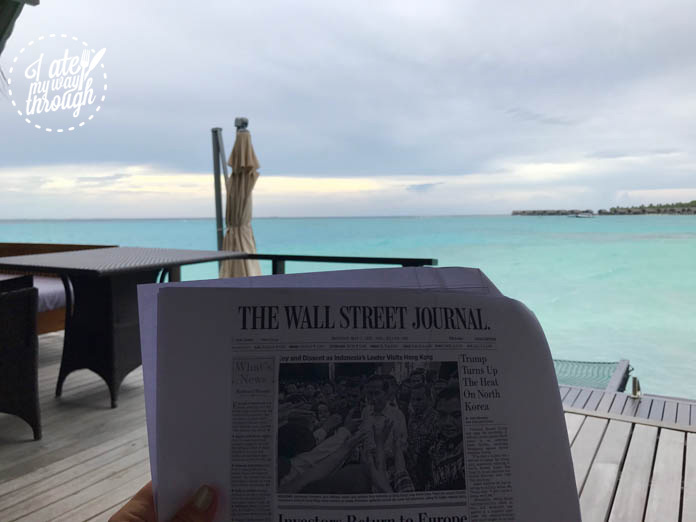 The Shangri-La Maldives is in a unique location at the South Atoll of the country with its international airport of Gan Island receiving direct flights a short one-hour flight from the Sri Lankan capital Colombo or a one hour flight from Malé. I would recommend flying in from Colombo as Sri Lankan airlines flies large aircrafts at reasonable prices as opposed to Maldivian Air from Malé which is a little less comfortable. As soon as we landed bright and early at 8am, we were greeted by the kind and warm staff, who took our luggage and guided us to our waiting golf buggy. The buggy speedily took us a mere 3 minutes to the waiting speed boat transfer which zoomed us at lightning speed to the resort. 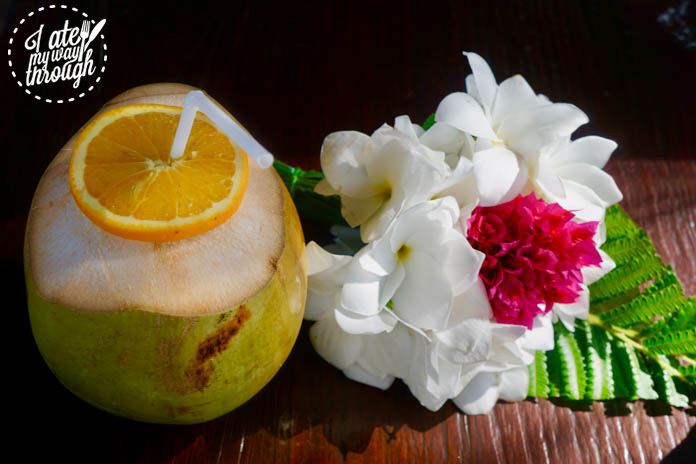 Within 10 minutes we had arrived, welcomed with a fresh young coconut water and cold towel. 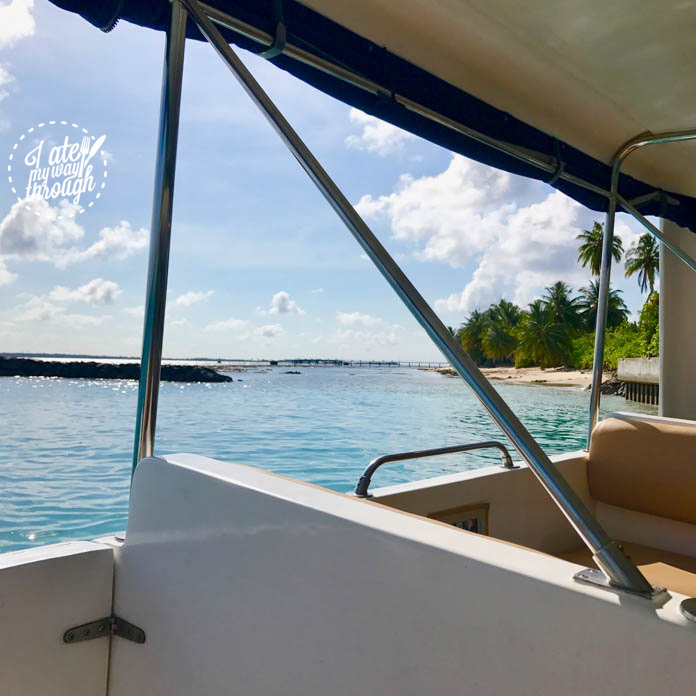 Another important to thing to note when picking Maldivian resorts is that a lot of hotels can be huge journeys from airports often including additional plane rides or more than hour long boat rides. This is not the case with the Shangri-La Maldives as the time from airport to hotel is twenty minutes max including customs & immigration. Shown to our room and introduced to our lovely butler, I was completely blown away once we walked in. 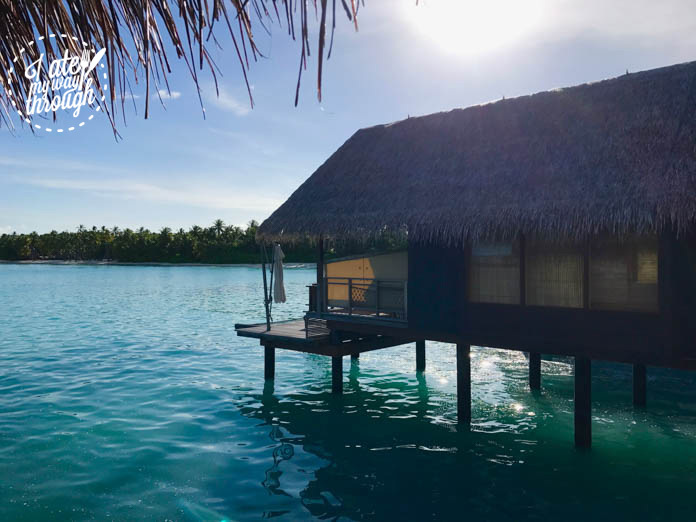 The overwater villa was incredibly spacious and impeccably designed, with calculated layouts and classy sophisticated finishes. 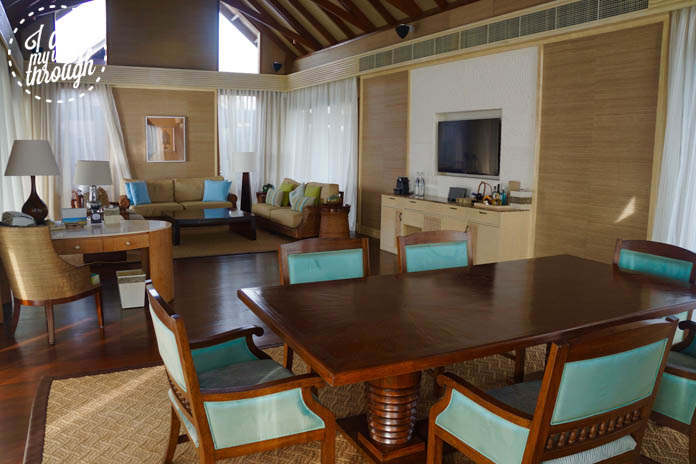 The lustrous modern design remained homely with a beachy feel radiating via the light timber finishes, blue accents matching the dazzling turquoise ocean outside. The divine king bed was heavenly and delivered the best night’s sleep possible, aided by the remote controlled blinds. These amazing shutters blocked out every inch of light as needed when wanting to shield your poor jet-lagged eyes in favour of a nap. A comfy window seat was perfect for perching which a desk on the other side of the room is great for those wanting to catch up on some work (but trust me that’s impossible when you see how incredible this resort is!) A huge walk-in wardrobe was perfect for even the biggest shopaholic, offering bountiful amounts of storage space, plush robes and slippers. However, the most thoughtful feature and perfect item was the complimentary pair of flip flops, if you happened to leave yours at home! I love that more and more hotels (especially in tropical destinations) are beginning to do this, as I am always guilty of forgetting this holiday essential! Onwards to the bathroom which has been voted one of the best of its kind in the world, and let me tell you that it is truly exceptional. The room glows with sunlight entering through the transparent glass design, whilst the ocean reflects dazzling sparkles back onto the ceiling. With a ‘his & hers’ sink and vanity flanking each side of the room with the centrepiece of a gigantic circular bath in the middle. 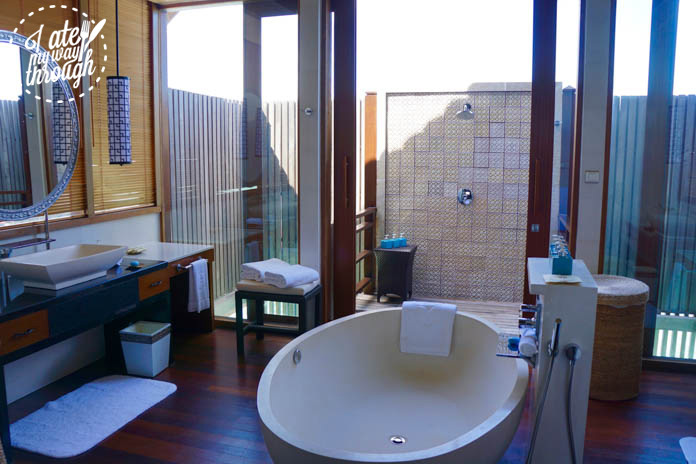 The outdoor shower sits on a walkway just above the ocean, providing mesmerizing views of the ocean washing below. 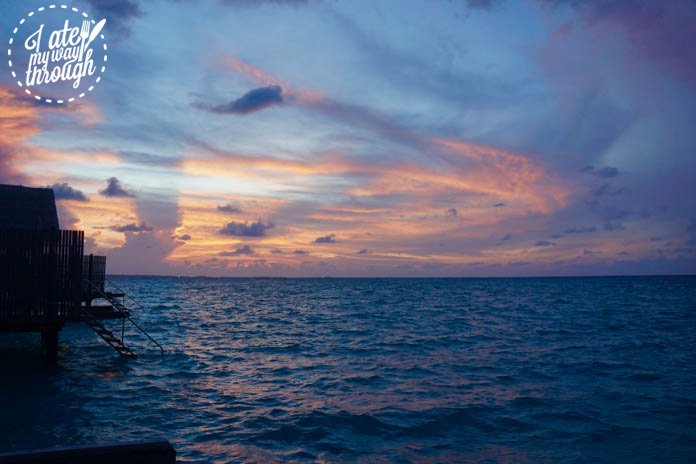 If youre lucky you might glance a stingray or turtle gliding below. 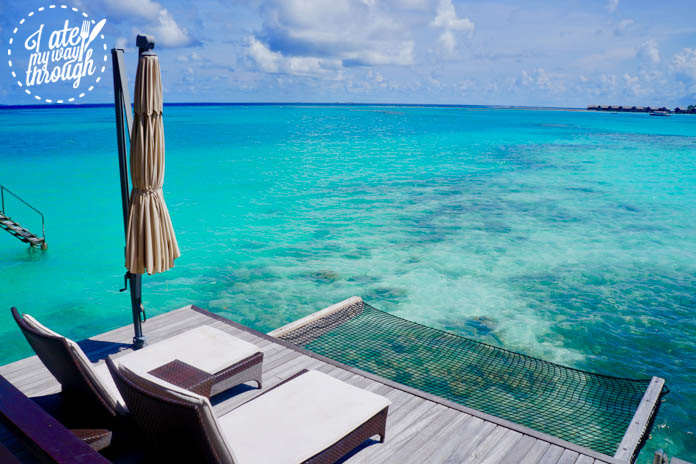 My favourite part of our overwater villa was the deck which led out to the sparkling aquamarine water beneath. A comfortable chaise was perfect for propping up on & relaxing in the shade with a book in hand whilst the table & chairs offer the perfect place to enjoy a private breakfast or midday room service delivery. A few steps down were two sun lounger’s ideal for any sun worshipper like myself, with a great big umbrella to shield from the strong midday rays. An overwater hammock net was the crescendo finale to ensure that if you didn’t feel like you were floating already, you certainly would now! I mean seriously what else could you want? One of the most interesting things about the island is its rich history, something I never in a million years would have anticipated. During WWII the British actually used this as an army base for their activities such as storing artillery, stationing soldiers and the likes. 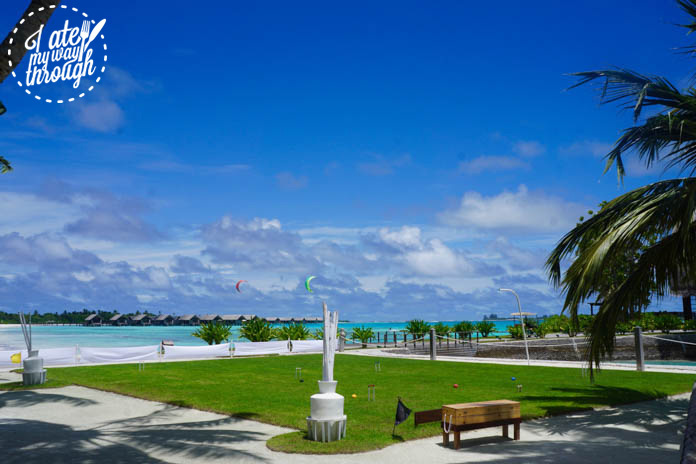 Villingili was an ideal location due to its proximity to Gan Island, which enabled the British to build a huge airstrip which is now the International Airport. 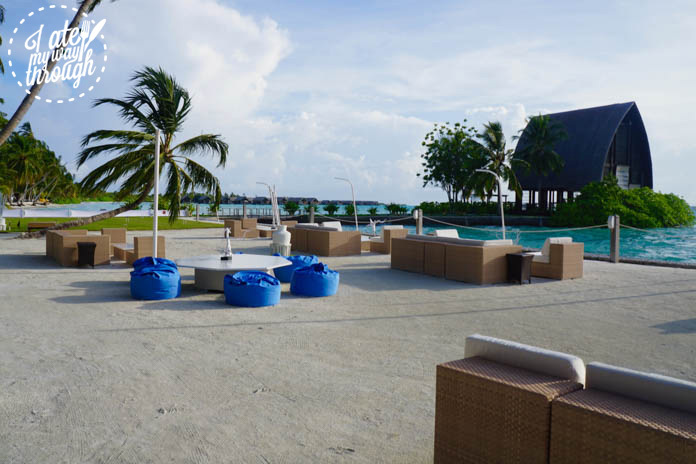 Another unique feature of the island is the sheer size of the resort, which at 3km long is one of the largest resort islands in the Maldives. 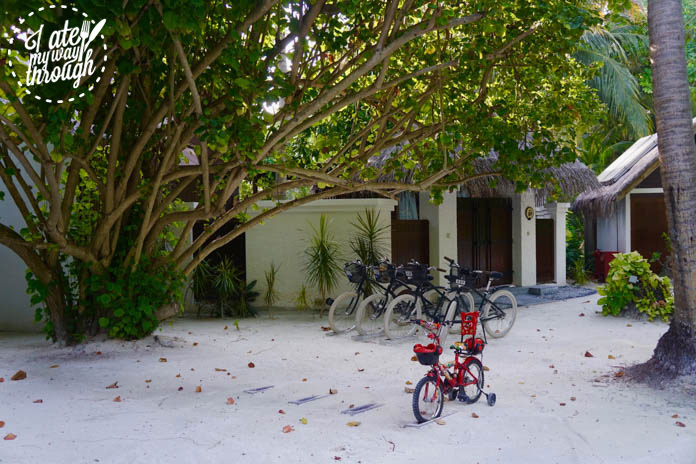 Luckily, each villa comes with equipped with gleaming white bikes to ride around on, allowing guests to explore the powder white sand paths. The bikes are perfect for helping guests to catch up on their physical activity or simply embark on mini journeys. 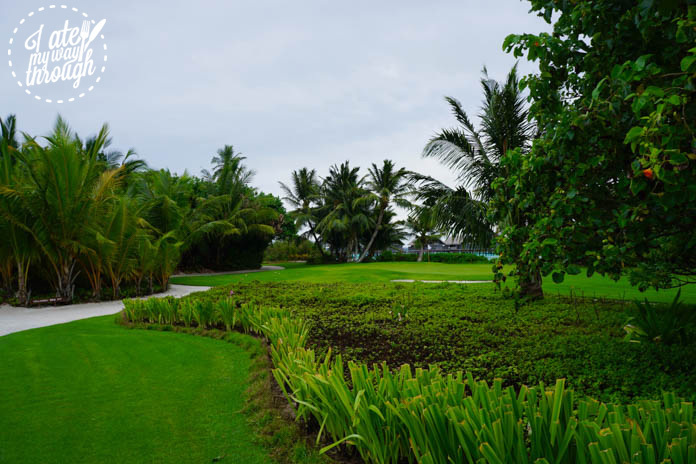 I loved discovering the many corners of the Shangri-La Villingili island from the amazing manicured lusciously green golf course to the river filled with hungry fish and a palm tree lined dock. 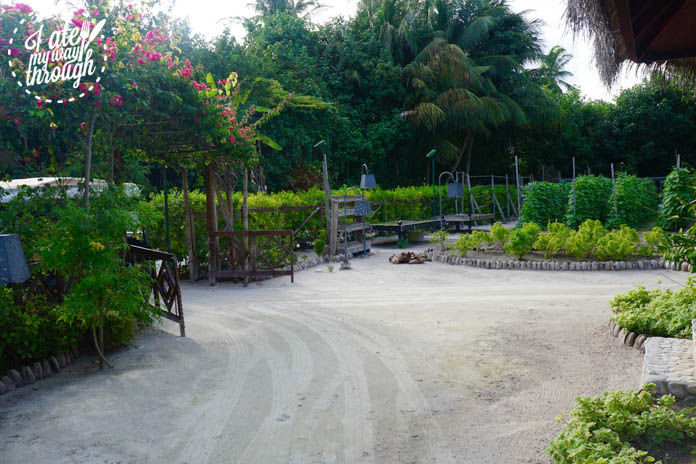 On a guided tour around the island we were shown the kids club, fully equipped gym, boutiques for souvenirs and traditional Maldivian items, water sports areas but also their orchid nursery and vegetable garden. 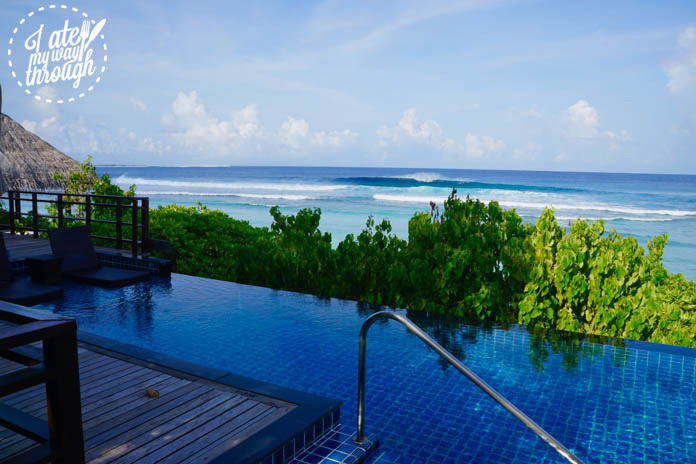 Obviously with the Maldives being such a remote location, most things are imported, hence the hotel has tried to minimise this by growing as much things fresh as possible. 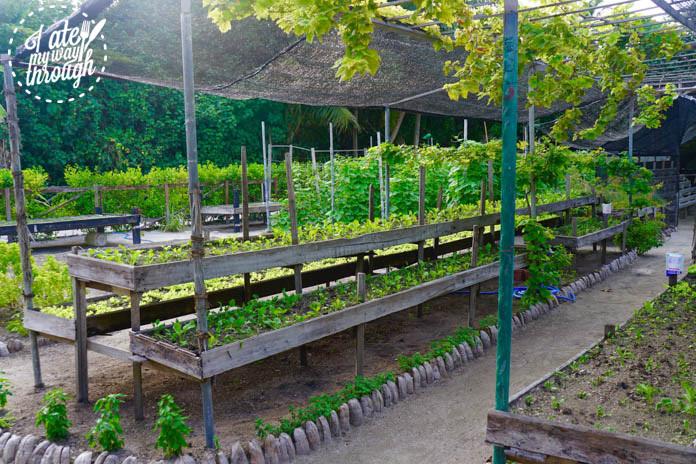 With vivid fuchsia bougainvilleas crowning the entrance, the expansive vegetable garden is filled with hundreds of herbs, fruits and vegetables which come straight to guests’ plates for ultimate freshness. 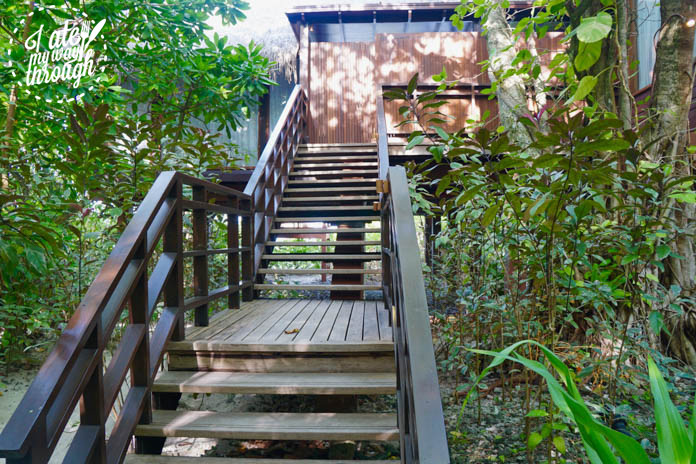 The signature Shangri-La Chi Spa was a peaceful place settled amongst the lush green foliage of the tropical jungle. Symmetrically lined, it was crowned with a zen & peaceful stooper. 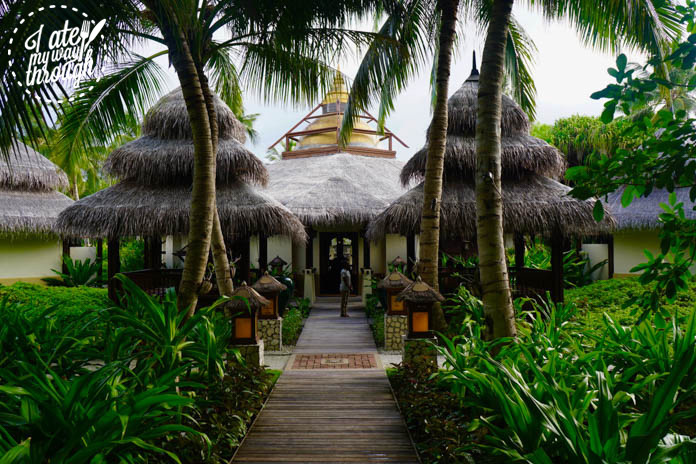 This led out to a meditation villa designed for yoga classes and calm contemplation, with participants absorbing the sound of the waves crashing just beyond. 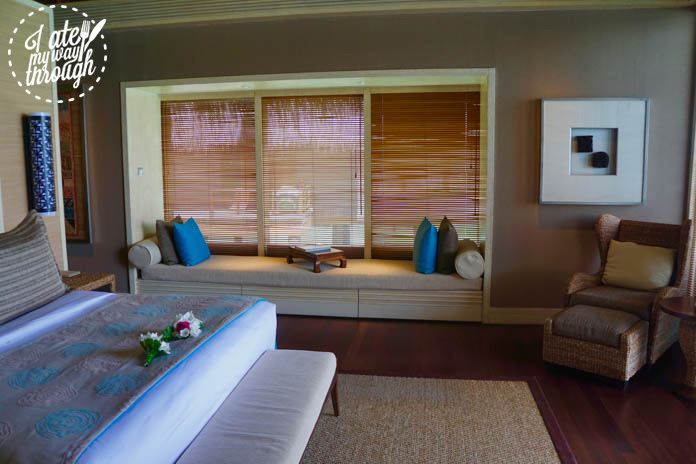 The hotel’s range of villas are diverse but cater to different needs. 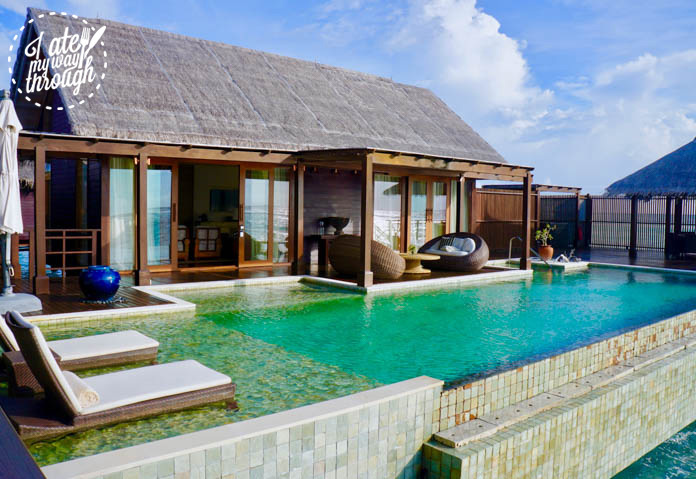 The entry level garden villa has its own plunge pool whilst the next level up is the overwater villas. 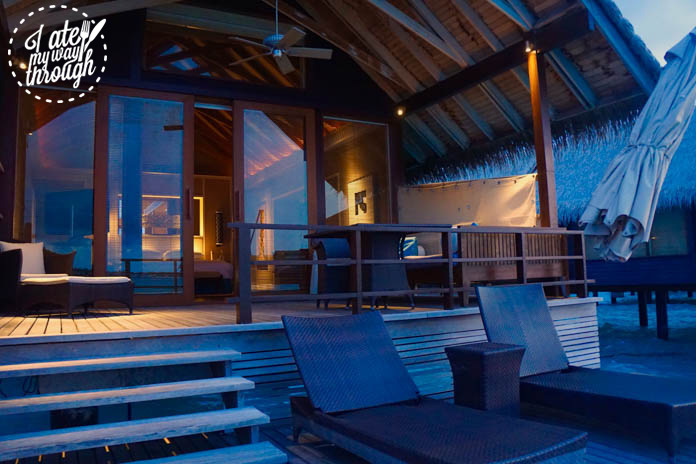 Families can enjoy a two bedroom villa of either type, with communal areas and private beach access. One of my favourite types was the Tree House Villa. 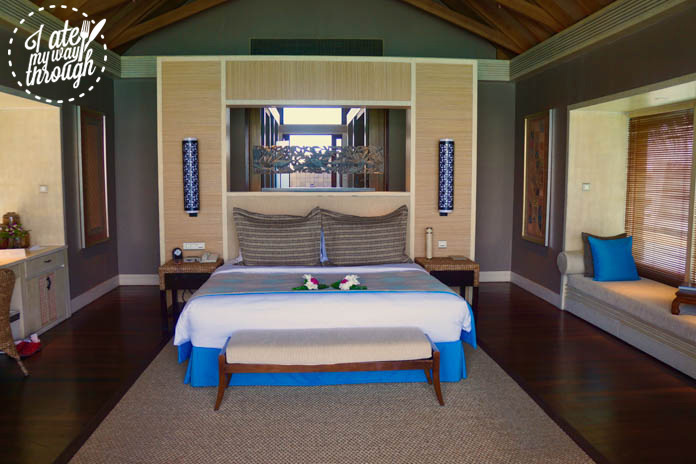 There was something truly magical about this one, with a special tree in the middle of the villa located beside the bedroom and living room and adjacent to its private pool. The outlook was enthralling, positioned out across the opposite side of the island where a clean glassy swell crumbled onto the reef. 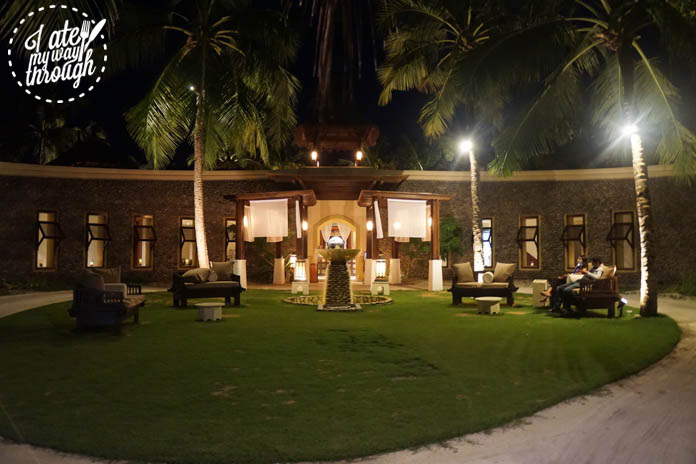 The other star in the resort is their Presidential villa designed for celebrities, royals, high profile & wealthy individuals. Perfect for those wanting absolute seclusion and utter privacy, this vast floating mansion is isolated on its own walkway. 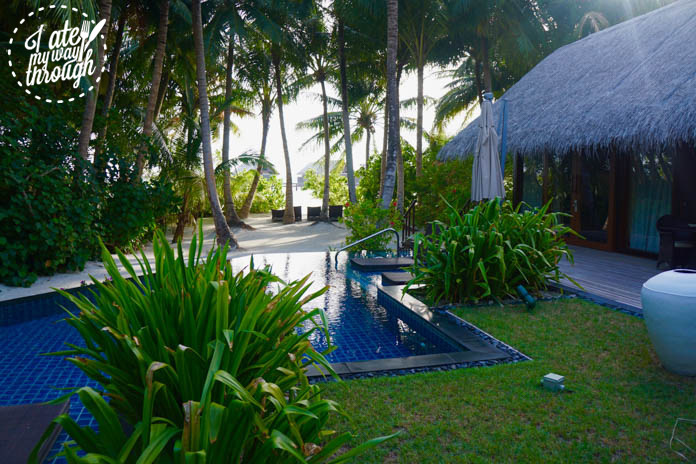 Guests are greeted by a generous plunge pool with floating sun loungers and big O shaped chairs. A huge living and dining room is a home away from home, with the luminous silk curtains billowing in the wind. The bedroom is not unlike others, just even larger again, with a dressing room featuring double dressers, before leading toward an even bigger bathroom. 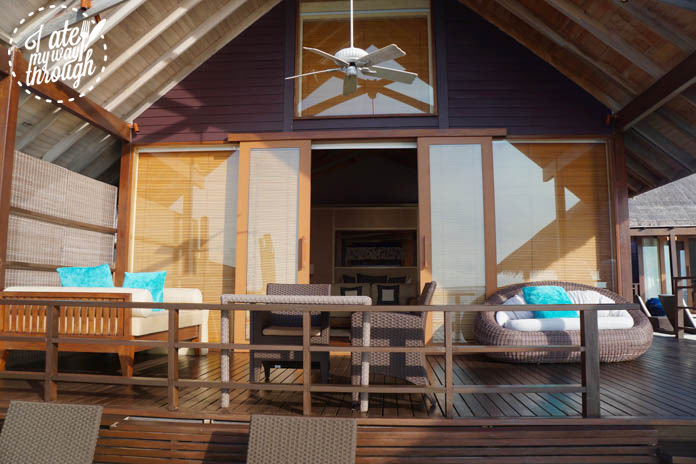 The deck is large and expansive, embodying the same gorgeous style and continuing the timber theme, with soft furnishes similar to what we had seen before. 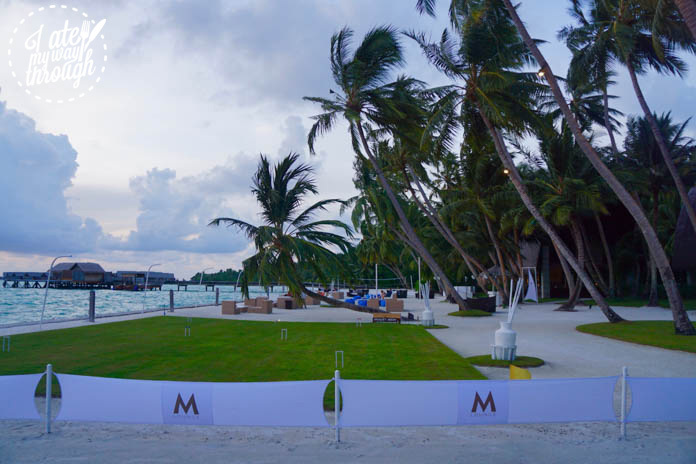 The perfect place to enjoy a pre-dinner drink has to be M Lounge, where one can watch the sun set over the horizon, whilst enjoying a cocktail from their daily happy hours from 5-7pm or 9-11pm. I loved this gleaming white style with bright indigo accents, echoing the natural colours of the powder sand and water beyond. It was very sleek and sophisticated yet still relaxed and beachy, reminding me of being in a really cool beach club in Mykonos or Bali. The soft lounge music lightly beating in the background set the tone for a serene dreamlike end to the day. For dinner, Dr Ali’s is one of the favourite eateries. 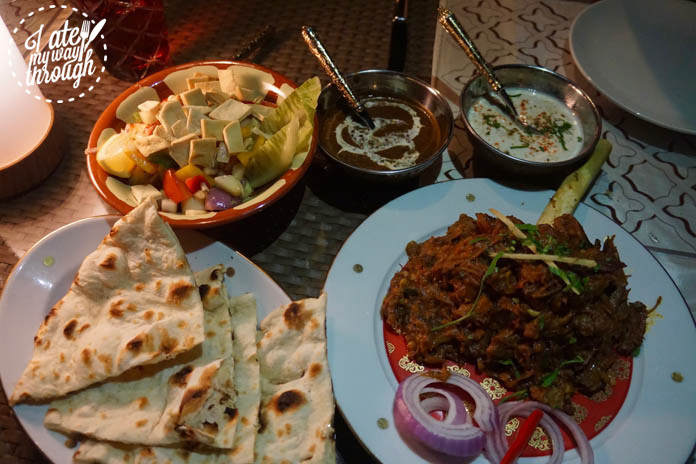 A fusion of Arabic, Indian & Asian cultures, the menu is vast and intensely overwhelming. 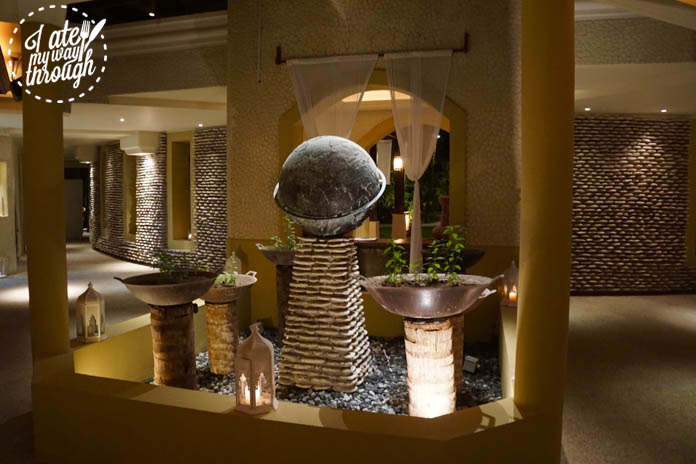 Entering this impressive restaurant we were greeted with an expansive entry with gorgeous Arabic inspired lanterns, cool sculptures and large woks which were growing fresh herbs. This was actually one of the most difficult times of the day, when we were forced to ‘umm & ahh’ about what to pick to order from the never-ending list of dishes. 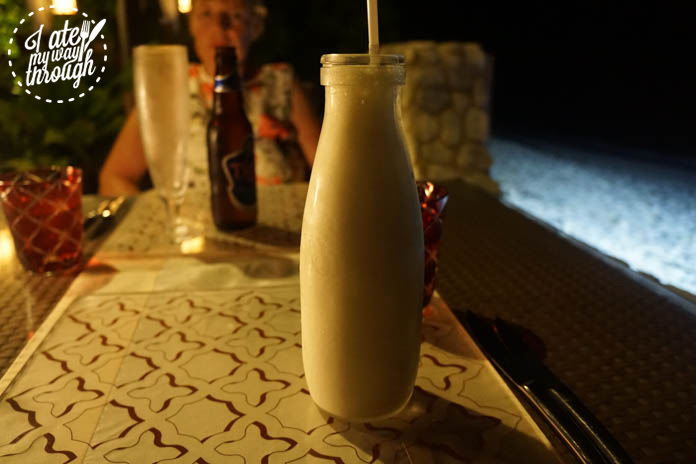 Luckily, we were not disappointed with our choices! For entrées we chose a dish hailing from each culture. 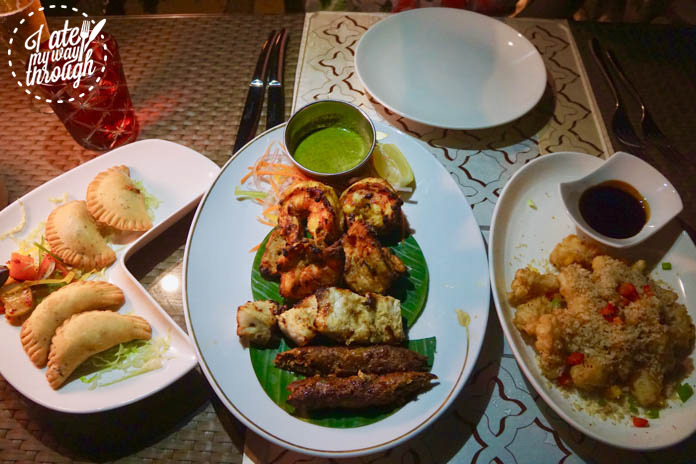 The Arabic cheese filled pastry Sambusek, the Indian mixed grill plate and the Asian Salt & Pepper squid. Each dish was delicious, cooked without fault and went down an absolute treat. Things were off to a good start. Mains had been incredibly challenging to settle on, yet we nailed our choice of Lamb Shank. Spiced with middle eastern spices in a rich tomato based sauce, the plate radiated with amazing flavour unlike anything I’ve ever tasted before. The slow cooked braised lamb featured some of the juiciest tender meat that was cooked so beautifully that it fell delicately off the bone. Utter heaven! 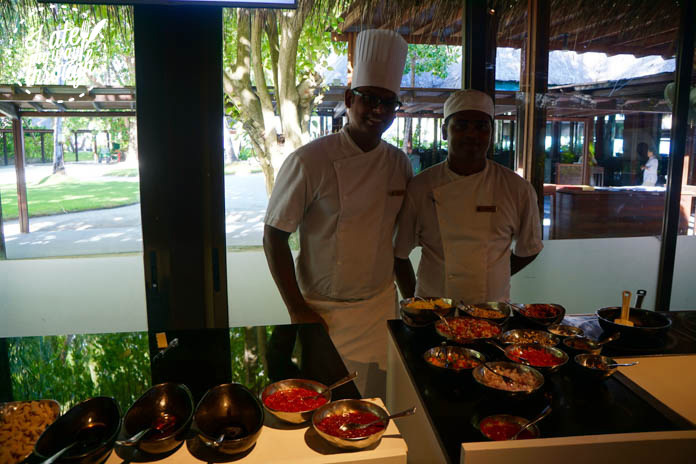 As we came to know, everything at the Shangri-La Villingili was done to first class standards and the breakfast was no different. 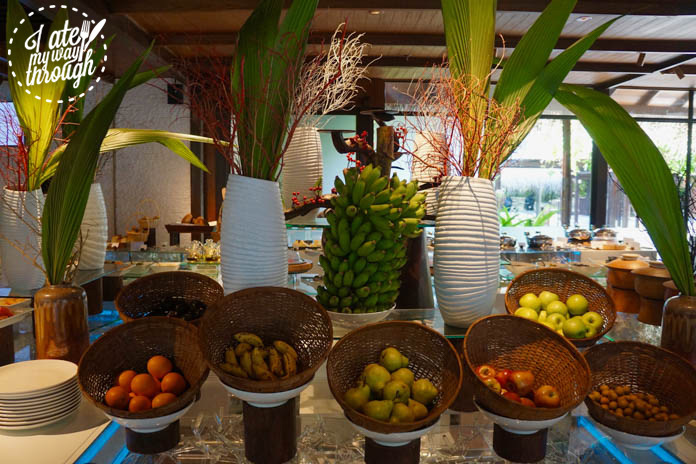 The buffet featured the highest quality array of produce, cuisines, pastries and dishes. 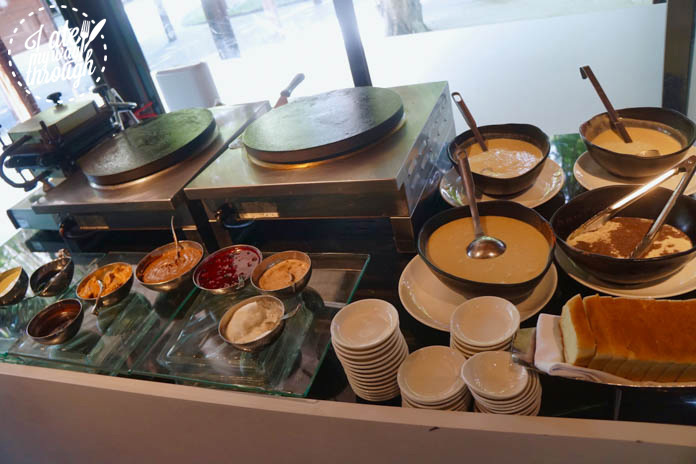 Highlights include the made to order waffle, French toast, pancake or crepe station with decadent toppings such as chocolate, Nutella, berry or caramel. Eggs were available however you may like, or perhaps an omelette if you fancy? 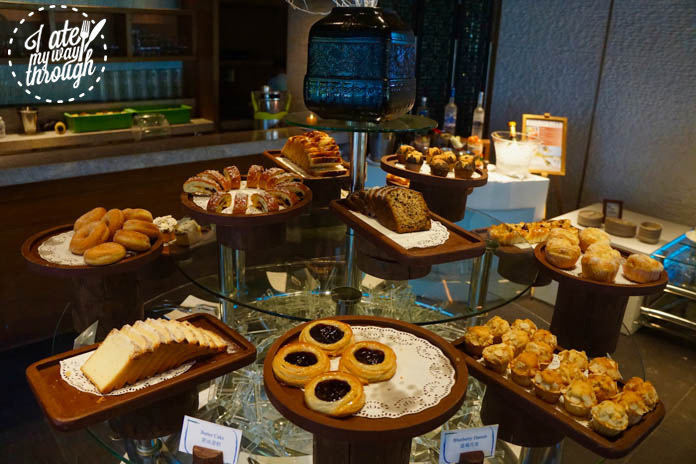 The pastries went beyond the usual expectation with creative takes that were crispy, short and melted in your mouth just wonderfully! One of my personal highlight’s was finding one of my favourite Chinese dishes from my time living in Shanghai. The egg & tomato dish instantly transported me back to my Shanghai days and had me sending my Chinese friends WeChat messages filled with excitement! It’s these unexpected little surprises that make holidays all the more unforgettable! Just a small and innocent touch as this, enhances your perception and appreciation for the finer and subtle ways that the guest experience is enriched. For those after the indulgence or hangover cure, there is a self-serve champagne bar stocked with Tattinger or a Make Your Own Bloody Mary station. 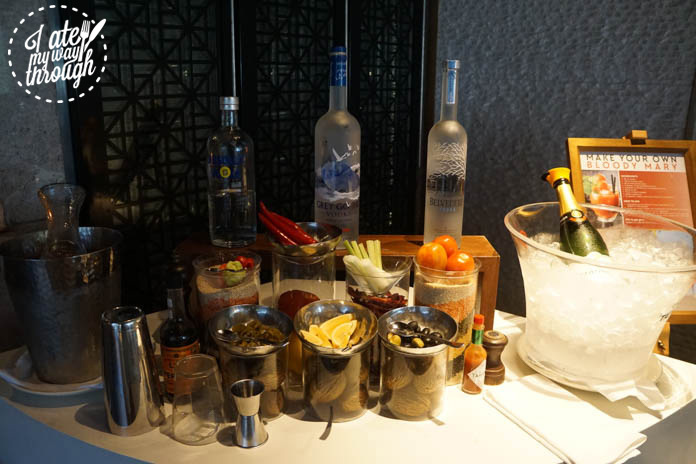 An indication of luxury is choice, the choice of vodkas here was bountiful and generous to say the least, Belvedere, Grey Goose and Absolut- take your pick! Mix with condiments and dressings such as tabasco, pepper, lemon, celery, pickles, chilli, peppers Worcestire sauce, tomato juice and probably more! 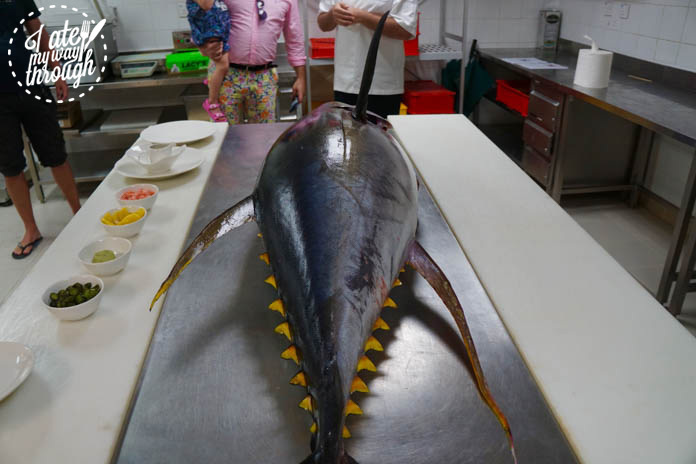 On another day, rumour had it that the one of the resort’s fishermen had caught an 80kg tuna. 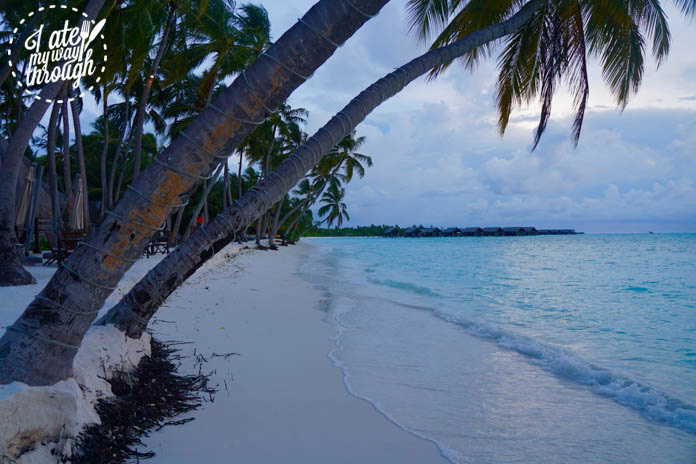 The Maldives is famous for their tuna, it’s the national food, one of the largest exports and what the locals diet’s thrive off. 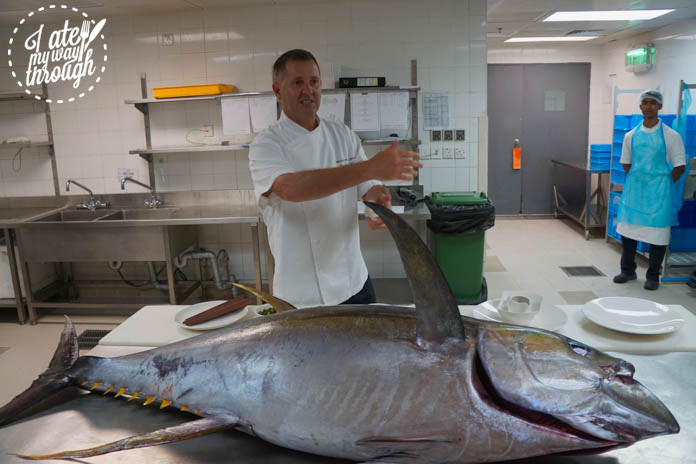 Australian executive chef Michael McCann came around at breakfast to invite guests back of house for a special glimpse into the huge kitchens of the resort where we would learn about tuna, the best parts for eating and hopefully enjoy some sashimi too. That afternoon we all met at M Lounge, guided by Michael’s assistant. 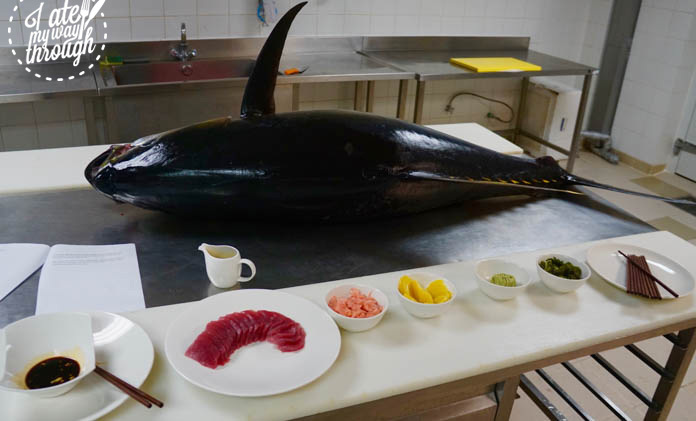 We put on hair nets and entered the absolutely immaculate room with gleaming white tiles and a big bench in the centre, home to a colossal sized tuna. Tuna travel at 6 times their body length per second, mostly with their mouth wide open, snatching up everything in its way, hence explaining why they are so big! 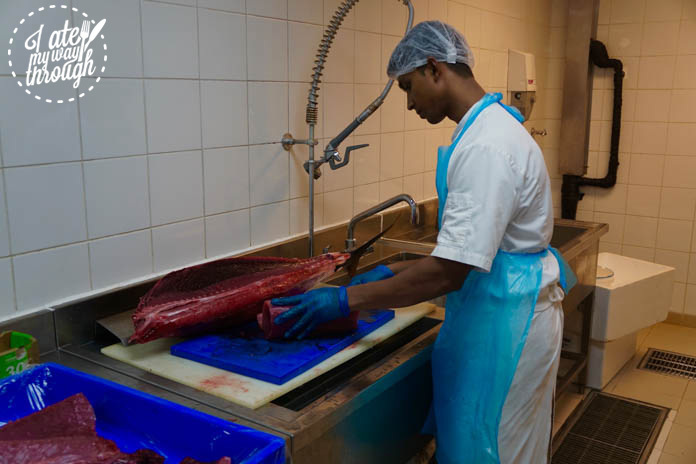 Another local Maldivian chef handled a fresh piece of tuna belly, and sliced it up fresh before our eyes, ready to devour. A range of traditional accompaniments were aligned to match the fish, which was fresher than a just popped bottle of champagne. The cutest thing was seeing a European father feeding the tuna sashimi to his adorable little girl using chop sticks. This two-year-old had good taste! 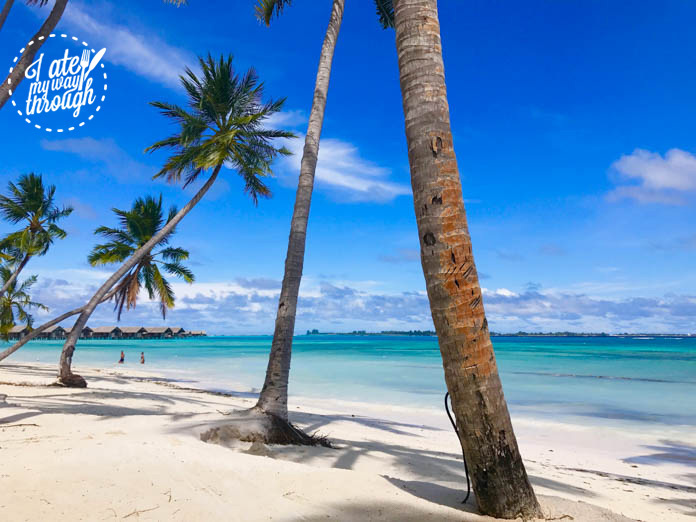 If you’re looking to burn-off your breakfast, activities include a dolphin cruise or snorkelling cruise which are organised through the dive centre. Whilst we did not prove too lucky on the dolphin cruise due to poor weather, the snorkelling is definitely worth a journey. The vivid neon colours of the fish whirling in and out of the coral, with schools jetting around at lightning speeds. There were Nemos of so many different varieties, fascinating colours and vibrant eye-catching patterns. Huge manta rays and eagle rays flap their ‘wings’ below, as well as sea cucumbers and starfish. 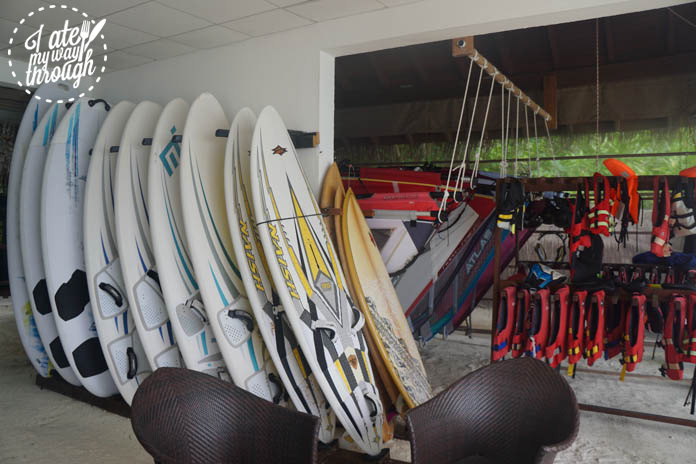 The water sports centre on the beach is also home to much with stand up paddle boarding, kayaking, kite surfing, mini catamaran or ‘hobby-cat’ sailing, jet skis, windsurfing. The central pool area sits below palm trees which whistle in the breeze. The staff bring you towels, menus, ice cold water and can keep you hydrated and nourished all day. 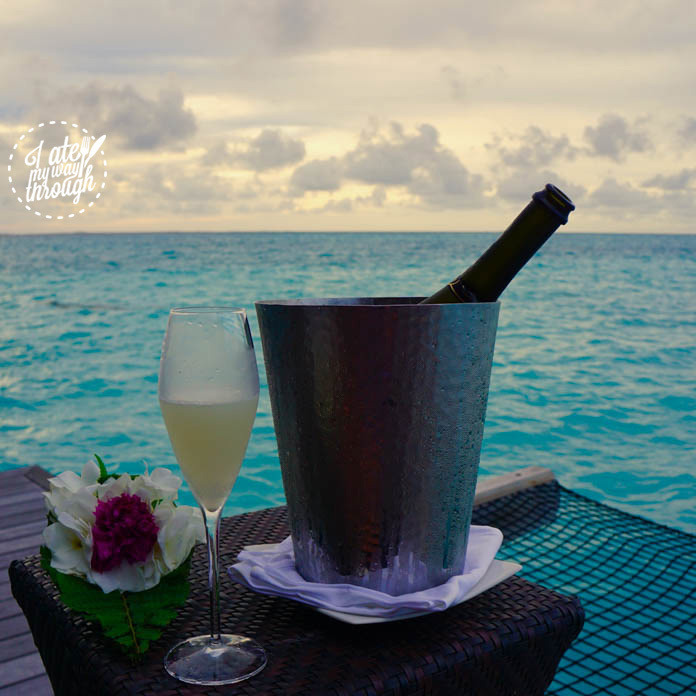 Before dinner the next night, we enjoyed a bottle of champagne on our overwater deck, with the waves lapping calmly just beneath our feet. A most breathtaking sunset with blushing rosy pinks and fiery oranges, glowed against a sapphire sky, with abstract patterns just like an impressionist art piece. 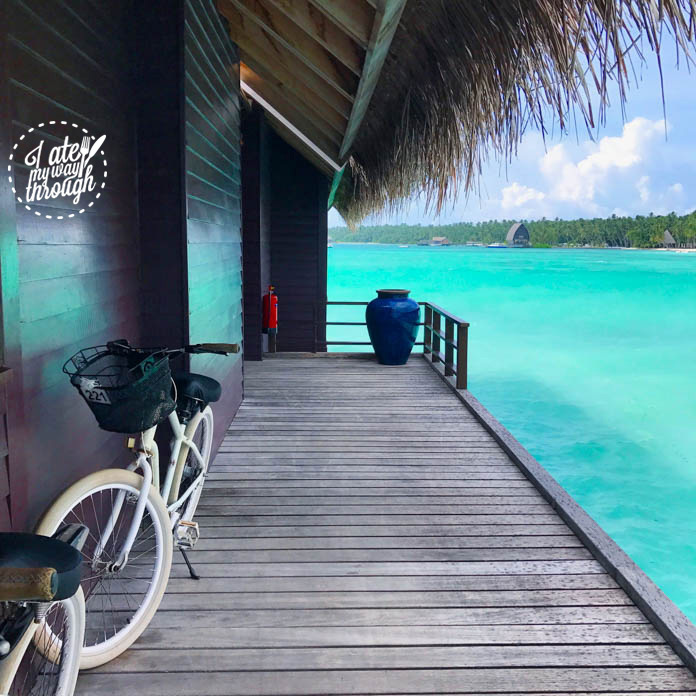 Whilst on our cruisy bike ride to dinner that evening, we spotted one of the signature Maldives activities of Dine by Design. 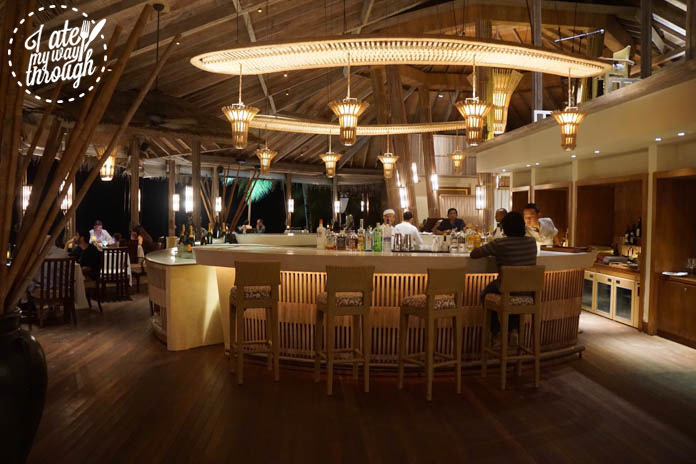 These special dinners can be organised in various secluded and private locations around the resort whether it be under the stars at their star gazing deck at the golf course, at one of the highest points of the Maldives, Mt. 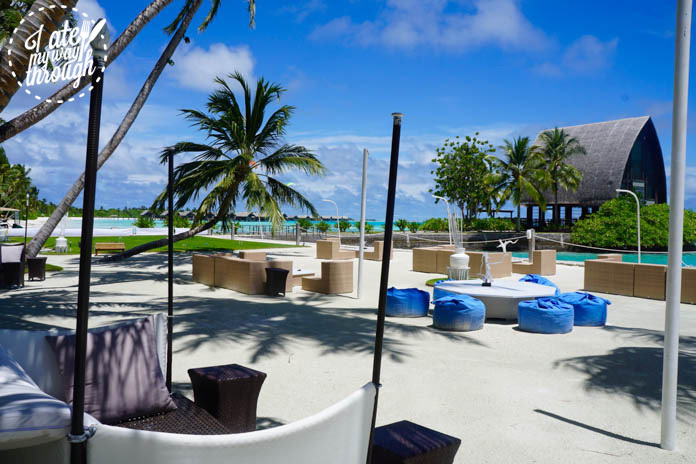 Villingili which features a BBQ pit, at one of the stunning lakes or as we observed on the beach front surrounded by glowing camping torches made from coconut husks, with waves lapping at your toes. 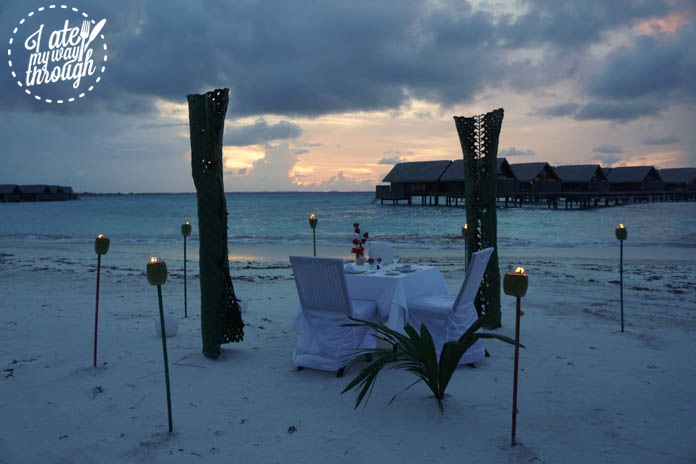 A menu is pre-chosen for these special occasions, with chefs preparing meals a stones throw away to give you privacy but still deliver the food searing hot from the grill. Meanwhile a waiter stands attentively ready to top up your glass as soon as its level lowers even in the slightest. That is superior five-star service at its finest. That evening we were off to other restaurant in the resort named Fashala. This was my favourite and probably the best of them all. The menu featured fine dining themed dishes with modern cuisine executed with flair. The chef here is also Australian, and he draws inspiration from his background with Australian meats a centrepiece of the menu. A great element of this restaurant is the local live performer whose acoustic guitar skills and amazing voice, hear your western favourites beating through your ears. 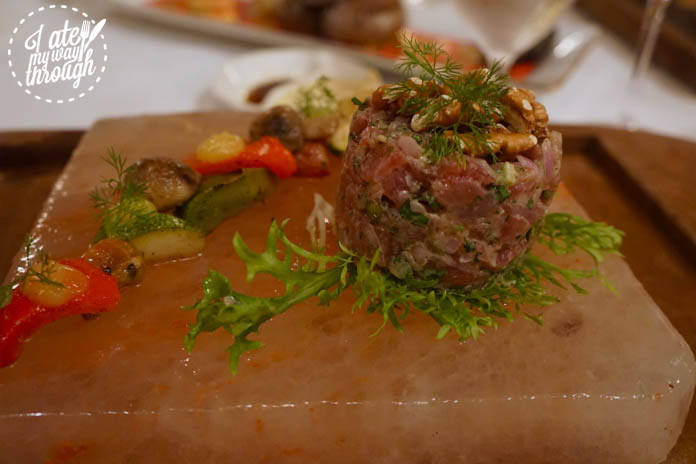 To begin we enjoyed a tuna tartare on a salt block accompanied by some marinated vegetables. The fresh tuna was seasoned wonderfully with capers, herbs, spices and a myriad of secret ingredients that yielded a delectable flavour. The homemade marinated vegetables accompanying the dish were outstanding, slightly pickled they had a unique but addictively good taste. 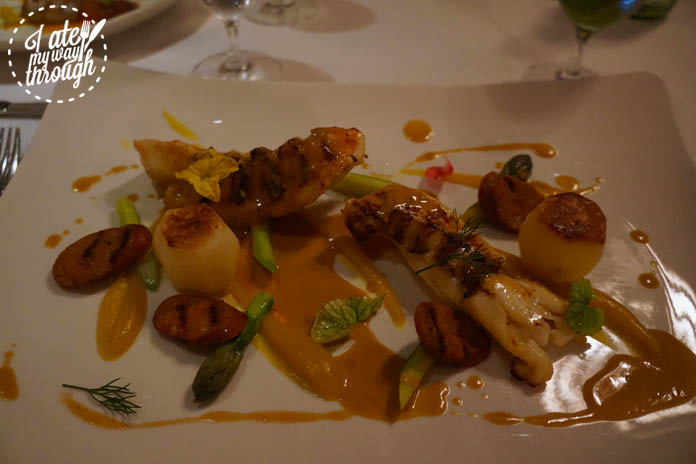 The scallop entrée was not what we expected, delivering a pleasant surprise of glory and beauty when delivered to the table. Thin ribbons of zucchini, puffed rice concealed some magnificent juicy pump scallops beneath. The dish was arranged so beautifully in an elegant assortment with edible flowers crowning the top with the welcomed addition of some indulgent truffle shavings. 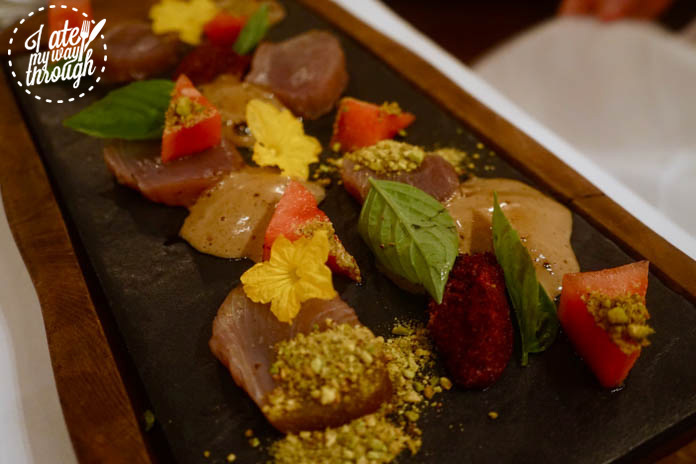 The other entrée was citrus cured tuna with pickled watermelon, onion foam, mint sprigs pistachio dust and labne. This was the winner of the evening, with the zesty citrus tang radiating through and pairing alongside the sweet faintly smoky onion puree. The watermelon and mint helped to lighten up the dish by adding a refreshing element to the mix. Everyone was recommending that we try the smoked duck, which in the Maldives seemed like an unusual choice, but was I can assure you it was simply bliss. 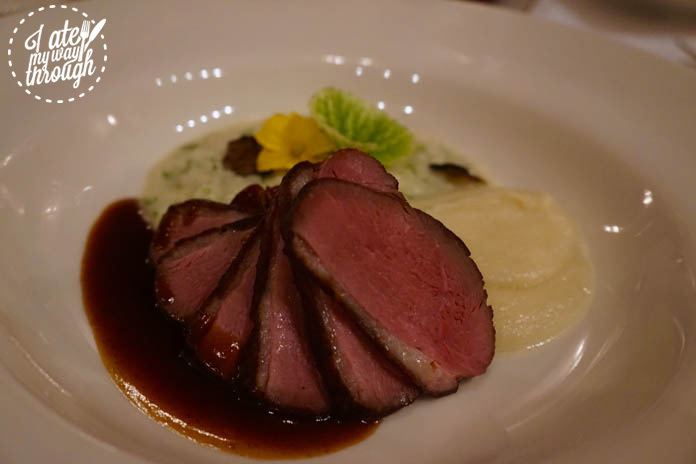 The duck was thinly sliced and served a luscious pink with truffle risotto, truffle shavings, a velvety mash potato and some rich jus drizzled beside. The lobster spaghetti was another winner. The homemade linguini pasta featured a mixture of crab meat, in a bright orange thick seafood bisque. The bisque was rich and heavy, a perfecting comforting meal full of warmth and love. 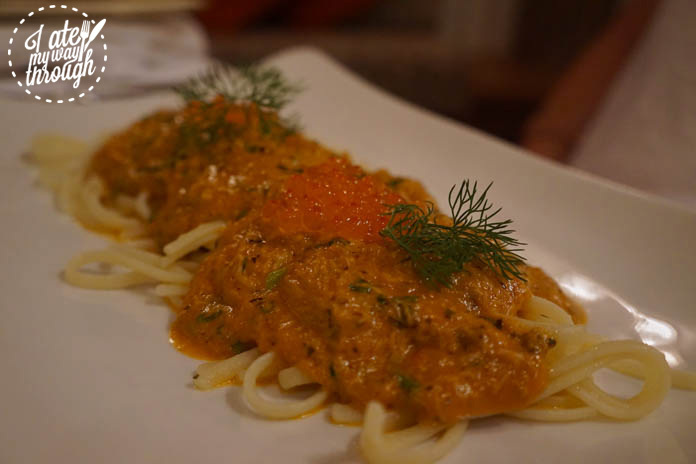 It was finished off beautifully with a topping of fresh dill sprigs and salmon roe crowning the top like tiny jewels. 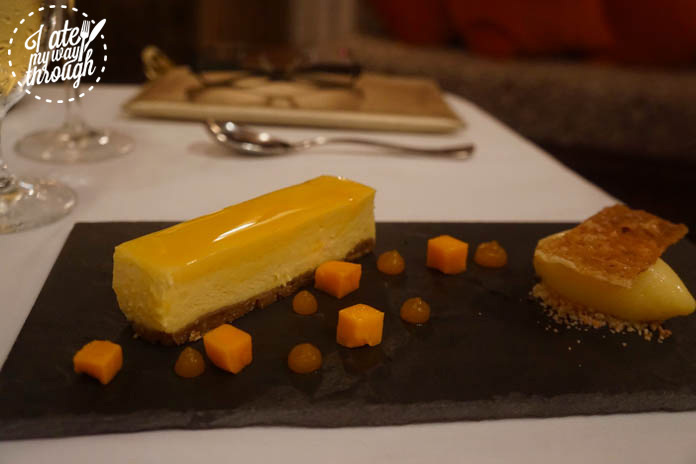 For dessert, my mother enjoyed the Mango cheesecake with mango sorbet. The cheesecake sat perfectly presented on the plate, gleaming a tantalising shine at diners. Little mango cubes decorated the plate as well as piped little jel jubes. This dish was light and fruity, but the cheesecake seemed to be missing something. 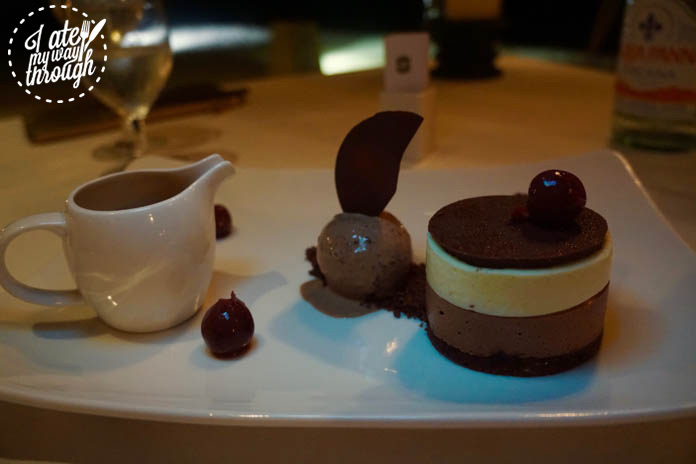 The other dessert of the chocolate mousse assiette was a delight to watch when it arrived at our table. A mousse with a milk and white layer sat beside a lusciously rich chocolate ice cream, and decadent chocolate sauce. I know that Asian cultures don’t like chocolate very often as it is too sweet, so maybe that is why the mousse was lacking, but the flavour didn’t shine like so much of the meal had. The chocolate sauce and chocolate ice cream however was ridiculously addictive and moreish, with us fighting over who would get the last bite. On our final day, I was so sad to bid the resort goodbye, it was a truly unforgettable experience with such warm and friendly staff ready to assist and serve you at every turn. 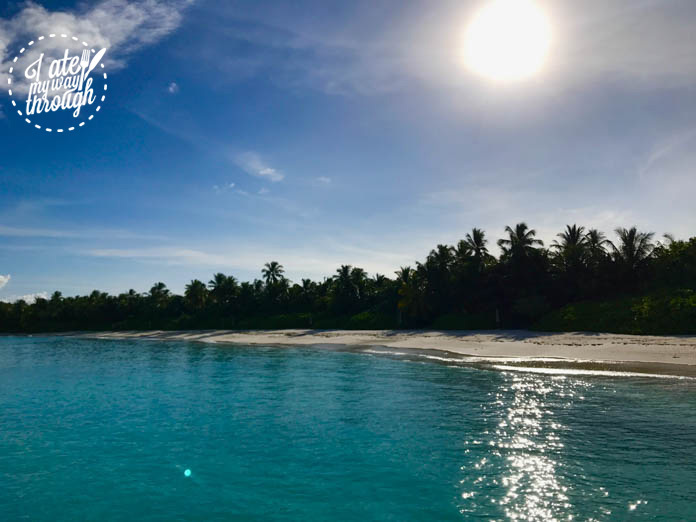 The dazzling blues of the azure water were exquisite and my favourite part of every morning was opening our electronic blinds giving way to the stunning aquamarine water a few mere meters beyond us. 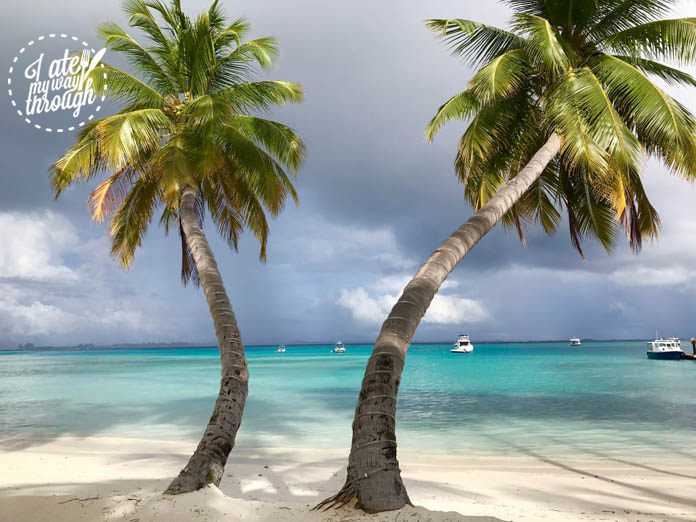 Even in the threatening situations of when rain storms approached on the horizon and swept through the resort, it was truly beautiful to see the myriad of colours and the millions of the blues that the water transformed to be. A big thank you must go to all staff, but particularly Jessica whose bountiful energy radiates the best ambiance and happiness to all those around her. She creates genuine relationships with guests, helping to enhance their stays in whatever ways she can all whilst maintaining a wide smile across her face. Jessica is a simply unbeatable asset to the hotel and all guests in her company.